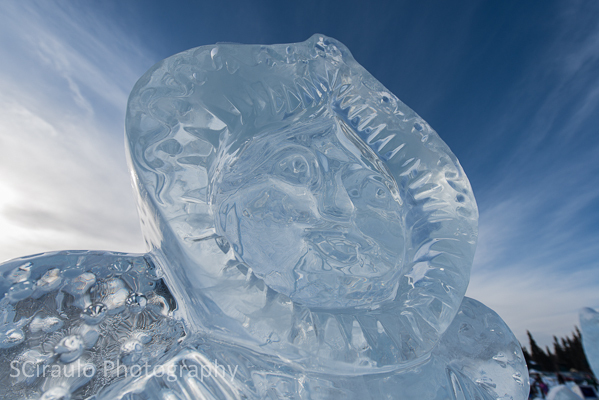 While waiting for the 2014 Arctic Winter Games to start, the “Opening Ceremony” took place earlier this evening (3/16), I had an opportunity to take in some amazing ice sculptures at the 25th annual World Ice Art Championships here in Fairbanks, AK. (Visit www.icealaska.com for more information!) Hundreds of single and multi-block ice sculptures that cannot be believed! Everything from life sized polar bears, whales, seals and assorted mythological creatures to complete winter scenes, intricate “ice bridges” an “ice peacock” and a walk-in “ice chapel” all carved from blocks of ice harvested from a nearby abandoned rock quarry that fills w/ water during the summer months and freezes solid in winter. Temperatures in Fairbanks are well below freezing for months on end hitting -40 degrees F on several occasions throughout the winter months. Locals tell me not to worry though because they say -40 F isn’t really so bad because “it’s a dry cold!” Fortunately, thus far temperatures have been nowhere near -40 F, and the weather has been magnificent with clear sky’s and lots of sunshine! During daylight hours, the sculptures are crystal clear and look more like glass than ice. At night the sculptures are lit with a series of multicolored lights and they take on a completely different look and feel. Truly amazing!